The design of the all new FREEDOM+ Surf is the result of collaboration with Ocean & Earth and 2x World Surfing Champion Tom Carroll. 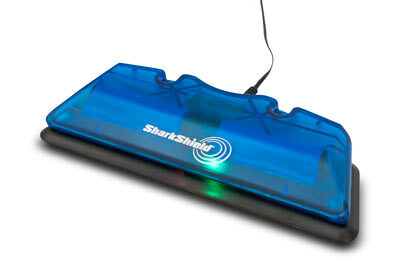 The removable power module with LED indication for power on/off and battery life, is housed in the custom designed Ocean & Earth tail pad kicker, enabling you to move the power module easily between your boards and for recharging. The all important antenna electrodes have been designed into a sticker thin adhesive decal applied to the underside of the surfboard. 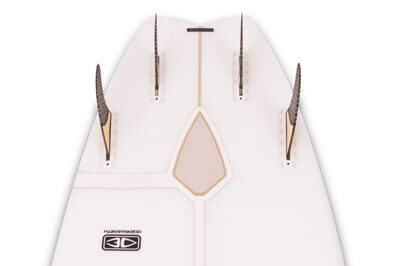 With a near zero drag adhesive decal antenna (only 500 microns thin), there is no impact on your surfing performance. This FREEDOM+ Surf bundle includes everything you need to turn your surfboard into an electrical shark deterrent. Suitable for boards over 5’10” ideally with volume so not performance boards, not suitable for children. 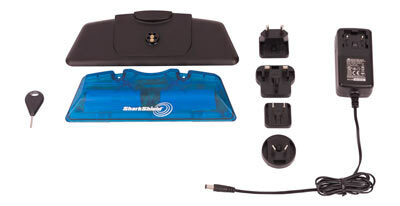 Now with the Shark Shield FREEDOM7 there’s no need to fear an unwanted encounter with sharks. This Shark Shield device is the only scientifically proven and independently tested electronic shark deterrent system designed to provide you with the peace of mind you’re looking for while enjoying your favorite pastime of freediving, spearfishing, scuba diving or kayak fishing. With over twenty years of world-class research and independent testing, it is no wonder it has become the safety device chosen by professional divers in the US and Australian Navies and has become mandated equipment in the Australian Professional Abalone Diving Industry. What’s in the FREEDOM+ Surf bundle: This FREEDOM+ Surf bundle comes with one FREEDOM+ Surf removable power module, a charging dock with international options, one Ocean & Earth Tail Pad / Decal antenna ready to install on your surfboard. The 30-Day Confidence Trial: If you haven’t become a more confident surfer while wearing the Shark Shield within 30 days, you can return the product with our Full Money Back Guarantee.